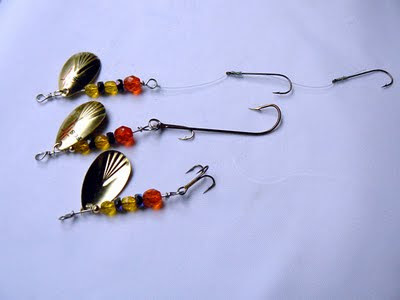 In the spirit of all the fishing country I intend to experience this summer, I built some special perch theme walleye spinners with assorted harnesses. Plan to get these in the water, for sure. 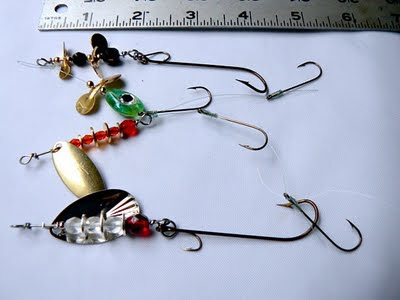 There ought to be a blog post or two from various sales trips featuring these little beauties swimming around in bliss or nestled in a walleye lip! I also intend to interview a few off the beaten path, bait and tackle shop owners and see where that goes. 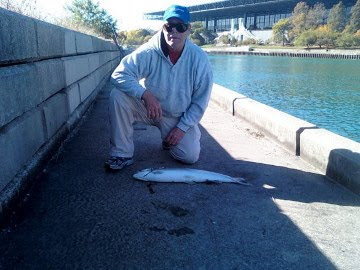 Got an email that a Yankin Jaw Guide Service client caught a nice fish on the Hula Spinner yesterday. 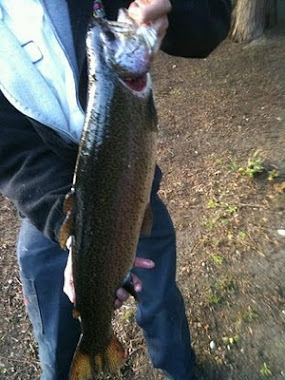 The fish was 42 inches long and weighed 20lbs. It was released. The lucky angler was sent a spinner for this picture, so I'm able to share it along with a few pictures of this new spinner design with anyone stopping by the blog or website. Here's the fish. Looks like it was a beautiful day on the water. 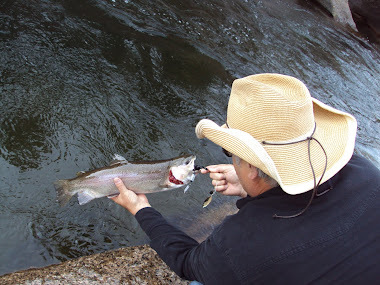 The fish took the spinner on his third cast into a promising spot. 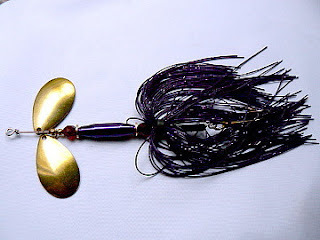 Now for a few pictures of various colors of the new spinner. It weighs one ounce. The Hula comes from two double Colorado blades and a stacked silicon starflash skirt. When I showed it to Marie, spinning it from my hand, she said it looked like a hula dancer. No more need to think of a name, whew. Thanks Marie! toward the break in the skirt. This avoids the need for a stinger rig. 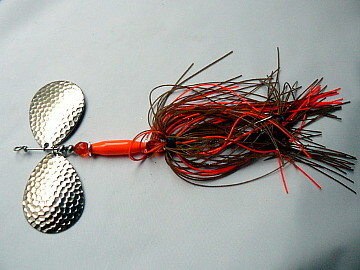 We have about 10 colors and either brass or nickel, hammered or smooth blade variations. We're using Colorado and Indiana blades #5's and #6's. This one caught the fish. Few more colors, I like this one. Cream white, brown faceted glass with olive skirt and Brass Colorados. Here's a purple and Smooth Brass Indiana version. Just in time for a summer sales trips. Party on! The Random.org gods favor New Mexico this month. 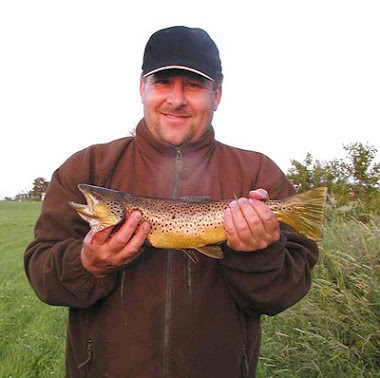 That's a Fish Enchantment forum grand slam, if I've ever seen one! Even going to the same address. Way to go Matt and Leah! 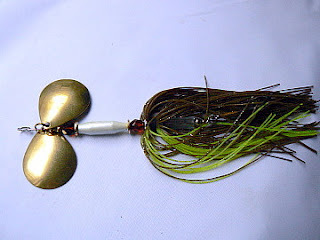 Spinners on the way tomorrow. Update 7/4/2011 - On vacation visiting family and will have the drawing on July 8th. Stop by again. 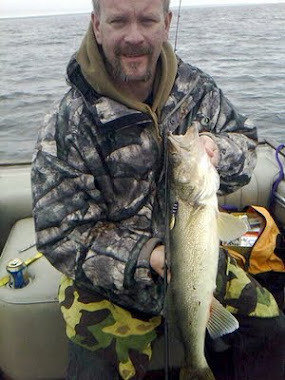 Here's a picture of a walleye caught on the orange Armadillo with the worm harness. Here's an assortment of some walleye spinners up for grabs. Comment the blog post to enter the drawing - if you enter as anonymous, leave a forum and ID or email addr. 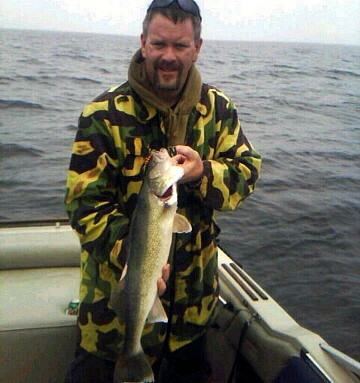 Need some Walleye pictures, btw!